Drapion is a Poison/Dark type Pokémon introduced in Generation 4. It is known as the Ogre Scorp Pokémon . 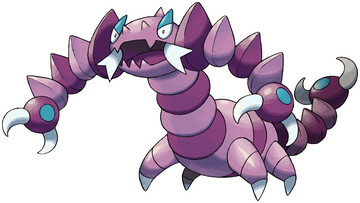 Drapion is a purple, scorpion-like Pokémon. Its body is segmented and it stands on four pointed legs. It has two large claws at the front, the tips of which release poison, and a similar large pincer on its tail. It can rotate its head 180 degrees. Drapion typically reside in the desert, although they have been spotted in marshland. Although Drapion is Poison/Dark type, it evolves from Skorupi which is Poison/Bug type, thus loses its Bug type upon evolution - a rare occurrence for Pokémon. The effectiveness of each type on Drapion. In Generation 4, Drapion has a base experience yield of 204. Drapion learns the following moves in Pokémon Ultra Sun & Ultra Moon at the levels specified. Drapion learns the following moves via breeding in Pokémon Ultra Sun & Ultra Moon. Details and compatible parents can be found on the Drapion egg moves page. Drapion can only learn these moves in previous generations. It must be taught the moves in the appropriate game and then transferred to Pokémon Ultra Sun & Ultra Moon. Drapion learns the following moves in Pokémon Sun & Moon at the levels specified. Drapion learns the following moves via breeding in Pokémon Sun & Moon. Details and compatible parents can be found on the Drapion egg moves page. Drapion can only learn these moves in previous generations. It must be taught the moves in the appropriate game and then transferred to Pokémon Sun & Moon. What is a good moveset for Drapion? Is Jolly a good nature for Drapion? Nidoqueen vs Drapion in RU? Is Drapion worth training in Diamond? What are the advantages and disadvantages of using Drapion or Skuntank?